Elise Margolis participated in the Under the Influence show in Fall 2016 at Village West. "My process is about making choices from infinite possibilities. Whether I'm using my deconstructed paintings, sourced images or searching for cut shapes from previous collages, I'm looking for the connections in color, form, texture along with the positive and negative space to discover how they interact and balance each other. My interested lies in the marriage of these elements and like people, seeing how and why they fit together to make their relationship work. I am grateful to have studied with the artist, Hananiah Harari, who in the 1940s, along with painting did collage. His was a mix of representational and whimsical elements forming his unique collage work. I am intrigued by his kind of storytelling, but for me, the abstract is the way to for me to express my thoughts. It's what I see on the inside that challenges me. 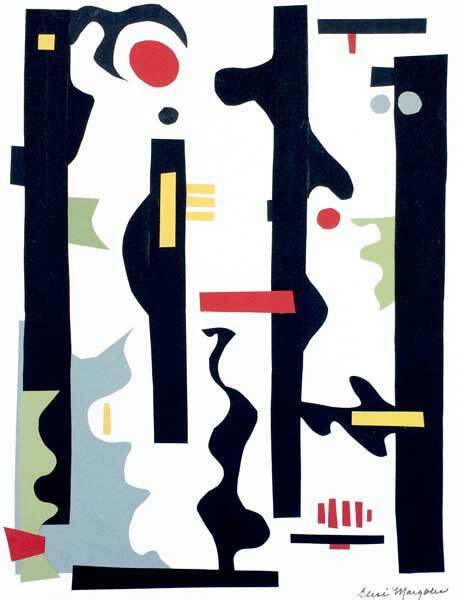 One of my inspirations has been the work of Stuart Davis. His work always looked to me like a puzzle, with shapes vying for their place. My work is also about finding solutions, making order and creating unity. For more information, please visit www.elisemargolis.com.